Poughkeepsie Journal 1 Jan 1787 "BEFORE the friends of Mr. Power" Appears in his manuscript book. 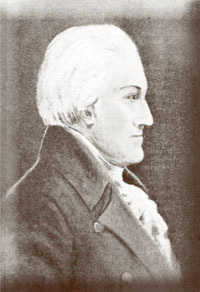 Nicholas Powers started the Poughkeepsie Journal in 1785. Poughkeepsie Journal 1 Jan 1788 A Scene from the Comedy called the "Printers Prentices" FD Roosevelt Library. This is written from the point of view of the same two young men Henry wrote for in 1787. 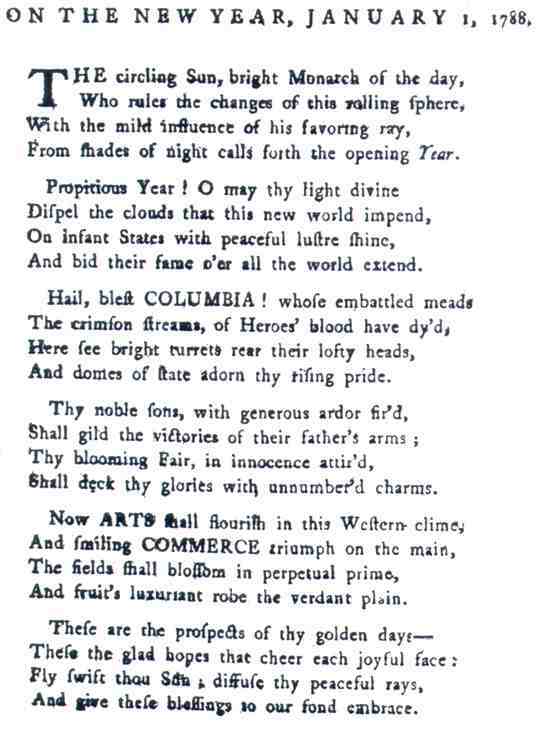 Unknown 1 Jan 1788 The circling Sun, bright Monarch of the day, . Political Barometer 1 Jan 1803 "All hail to the season so jovial and gay" Thomas Collection. Attributed by Henry's granddaughter, Gertrude Thomas. The Political Barometer was published in Poughkeepsie from 1802 to 1806, by Isaac Mitchell. His relationship to Henry's next door neighbor, Stephen Mitchell, is unknown. 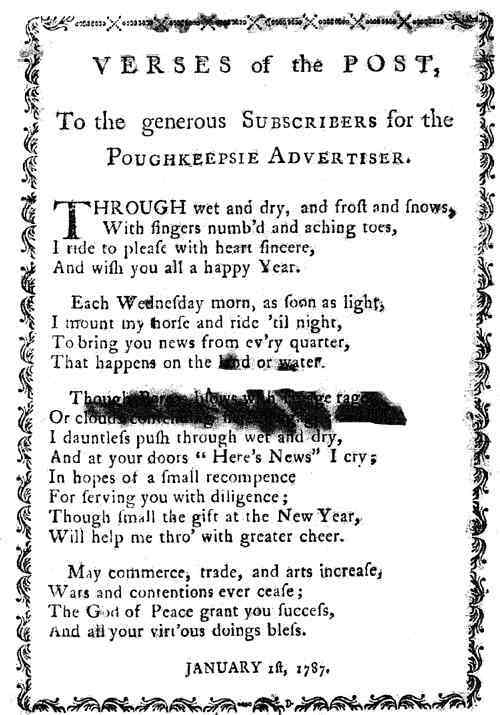 New-York Commercial Advertiser 2 Jan 1805 "ONCE more, his Patrons to revisit," . Political Barometer 7 Jan 1806 "THE rolling year is round again," . Political Barometer 13 Jan 1807 "To the regions of Pluto, and banks of the Styx," . Poughkeepsie Advertiser 1 Jan 1809 "LAST night father Time, from his old tablet drew," Thomas Collection. Owned by the Thomas family, descendants of Henry. Balance 1 Jan 1811 "Had our young cobbling muse but time and tools," . Poughkeepsie Journal 1 Jan 1819 "TIME, with his pinions broad and strong" Adriance Collection. Attributed by Henry's granddaughter, Gertrude Thomas. Christian Advocate and Journal 1 Jan 1844 "Good morning, patrons! once again" Henry's been dead 16 years. Tioga Banner 1 Jan 1849 "A good old-fashioned, honest lay," Henry's been dead 21 years. 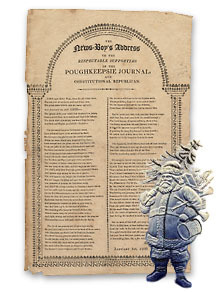 Nicholas Power began publishing the Poughkeepsie Journal on August 11, 1785. From 1792-1793, he also published "The Farmer's Register" in Kingston. On Apr. 1796, he added Richard Vanderburgh as his partner, but the partnership fell apart in November of the same year. The Partnership of Nicholas POWER & Richard VANDERBURGH is dissolved by mutual consent; and all persons concerned will take notice, that the business will be continued by Nicholas POWER only, to whom all debts due to said partnership are to be paid. The above partnership is dissolved in consequence of the said Richard VANDERBURGH'S expectation of going into business in another county. On March 27, 1798, Power had a new partner, Henry Collins Southwick. Power died in Poughkeepsie in 1811, at the age of 51. Isaac Mitchell is known today as a writer, but from 1798 until his death of typhus on November 26, 1812, he was also a journalist, publisher, and editor, mostly in Poughkeepsie, but for a time in Albany. His politics was strongly Jeffersonian Republican. Mitchell was originally the publisher of the American Farmer and Dutchess County Advertiser, a Poughkeepsie newspaper publishly weekly from June 8, 1798 - July 22, 1800. From 1801 to 1802, Mitchell owned an interest in The Guardian, another Poughkeepsie paper. In June 1802, he renamed the paper The Political Barometer. He continued to publish the paper until 1806, when he sold it to Thomas Nelson and Son. From Nov. 11, 1806 - Dec. 27, 1808, Mitchell published the Republican Crisis in Albany on a semi-weekly basis. But Poughkeepsie must have held quite a pull for him, because he was back in the town in 1808 as editor of the Republican Herald, another weekly newspaper, a position he kept until 1811.